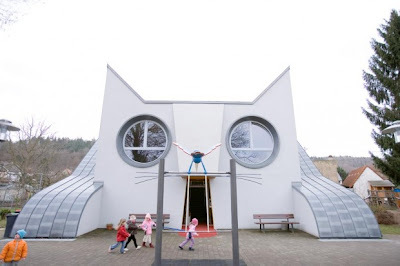 Milk Magazine is reporting on Die Katze, a cat shaped kindergarden located in Wolfartsweier, Germany, designed by internationally renowned artist Tomi Ungerer. Ungerer, who was inspired by his "favorite animal," describes cats as "an animal that is smart and aware of being," making the body of a cat the purrfect place for children to learn and grow (It's a good a place as any, I guess!). The school's entrance is the cat's mouth, where students must enter before being swallowed into its belly that consists of a dressing room, classrooms, a kitchen, a dining room, and a staircase. The head is a main room, brightened by eye-shaped windows, and the arms looks like slides, although I'm not sure they function as such. Although not pictured, "like any self-respecting digestion, the mice (Ed: aka children!) are evacuated in the event of emergency by the underside of the tail," and there's also grass growing on the building's flat roof, to simulate a cat's coat. Everyday is Caturday for the 100 lucky students that get to attend school here, and as Sophie Carre wistfully reports, "Everything is made to ensure that they learn while having fun. It is in their adult life they will remember with nostalgia of their childhood, because it is not given to everyone to have spent his early years in a cat." OMG, the architect is a genius. What a wonderful way to attend kindergarten. You are a cat culture magnet. Tomi Ungerer is my favorite illustrator/artist! He is just brilliant. I collect his children's books and his art books. One of my fave children's books by him is Flix, about a bulldog that is born to 2 cat parents. His political illustration work was actually very edgy in the 60s/70s. I heard about this cat kindergarten when his children's books were re-released recently. Years ago, I designed my Dream House to resemble a cat! The ex nixed that idea.